Despite their somewhat playful nature and vibrant, colourful website, hosting provider FatCow are serious players in the shared hosting market, changing the game in at least two key areas. Though I’ve previously given iPage much of the credit for popularising the now industry standard all-inclusive, unlimited hosting plan, even they had to get their idea from somewhere, and that somewhere just happens to be FatCow. Not only that, but the Endurance International owned brand were one of the first major hosting companies to focus on using renewable energy sources, making them a solid option for eco-conscious businesses. FatCow have made some big improvements to their pricing structure over the last eighteen months, and their ones I’m very happy to see. I used to regularly bemoan the fact that not only did the company only offer US dollar as a currency, but that they charged a full one year’s hosting fee up front, with no flexibility to pay for smaller terms. Thankfully, both have since changed. The company does now accept payments in British Pound Sterling, which saves website owners like you and me from trying to work out the true cost of our hosting plan in our own currency. They also offer multiple terms, limiting the amount of initial investment you’ll need to get started. Yet whilst the up front costs may be less severe, it’s still worth mentioning that FatCow are at best competitive with some other leading brands, and at worst one of the more expensive options on the market. The regular hosting fee of £8.95 per month is the same of that currently offered by the aforementioned iPage, whilst the first term discount of £2.50 per month makes them only marginally cheaper than the likes of SiteGround and GoDaddy. All three of these brands offer the same kind of unlimited hosting as FatCow, though the latter two do it at a couple of pounds less when it comes to the regular hosting fee. With the latter, each email account you set up comes with the limit of 500MB of storage space or 10,000 messages depending on which comes first. So far, so standard. This is likely to be a particularly common theme throughout this review. In most areas -including the quantity and quality of features on offer- I’ve found that FatCow are reasonably average compared to many of their competitors, and only really outdo themselves with it comes to the eCommerce tools which we’ll talk about later. For now, let’s keep moving and discuss the free domain name that comes with your plan. Including a free top level domain name with a shared hosting package is fairly common practice in the industry, so it’s no surprise to find that, as one of top providers on the market, FatCow include a free .com, .org or similiar domain in their FatCow Original hosting package. If you’re planning to use your plan to host multiple websites, you’ll be pleased to note that -like most similar packages- unlimited sub and addon domains are included in the £2.50 per month plan. Though the somewhat playful nature of FatCow’s design and presentation may be enough to have hardened professionals rolling their eyes, it actually does much to help make their Original unlimited hosting plan very friendly to newcomers without being patronising. Well-defined, clearly labelled navigation menus make working your way around your hosting package a breeze, with no feature or tool more than a click or two away. Meanwhile, use of the vDeck dashboard makes taking care of everything associated with your hosting package as easy as selecting the appropriate icon. A popular alternative to cPanel, vDeck is a highly visual, highly intuitive user interface which provides you with a simple, effective means of doing everything from launching web building platforms like Weebly and WordPress, to managing your email accounts, and even taking care of some of FatCow’s more advanced features like the shared SSL and website analytics tools. Though I’ll cover customer support in greater detail further on in this review, it’s worth mentioning here that there is a solid library of help files, walk-throughs and tutorials available, so if you do get stuck, it’s easy enough to get hold of clearly written, step-by-step instructions to get you on your way again. Speaking to both clients and fellow website managers, one of the bigger concerns I hear about green hosting companies like FatCow is that their reliance on 100% renewable energy sources to power their web servers will affect uptime levels and over all performance. From first hand experience, I can say that this generally isn’t the case, with my own sites regularly returning uptime levels of between 99.9% and 99.99% uptime over the most recent six month period. Part of the credit for these top scoring percentages must go to the company’s cloud-type server set up, where your pages are actually distributed across several servers to reduce the impact of any lagging or downtime on one physical device. By pooling resources, FatCow are not only able to serve up pages quicker, but ensure that sites are almost entirely always online. Meanwhile, every server in the group’s data centres has a backup copy which is ready 24/7 to fire up in case something happens to your primary hosting server. All in all, I’m impressed with FatCow’s performance and reliability, and though I wouldn’t say they do anything out of the ordinary, they’re certainly on a par with other leading competitors. Catering for users of all levels of skill and experience, FatCow offer multiple options for building and launching a website. Along with FTP accounts for uploading sites created offline, intermediate and advanced users will be glad to note that one-click installation of platforms like WordPress, Joomla, and Magento is available through vDeck. Along with these, you’ll also find support for tools which add greater functionality and user interaction to yoru site, such as phpBB forums, guest books, Gallery2 photo gallery software, and many of the applications that you’ll get with other unlimited hosting plans. For serious developers, FatCow Original hosting supports PHP versions 4 and 5, Python, and Perl, and comes with its own script library and CGI Directory. That’s all well and good for that audience, but what about those of you looking for a quick, simple way to build your very first website? Don’t worry, FatCow has you covered, too. Available through vDeck, the company offers a drag-and-drop website builder based on the popular Weebly platform. If you can use a mouse, you already have all the technical skill you’ll need to create a fully functioning, visually appealing website using this tool. The website builder comes with a library of free, professionally designed templates, which you can then customise by changing the colour scheme and images, adding new elements, and even incorporating blogging and eCommerce tools. Though I do normally prefer to build sites with WordPress and Joomla, I did give FatCow’s website builder a trial run for the purposes of writing this review. I was happy to note that it was very easy to use, that the website templates were generally of a high standard, and the overall finished results were as good as anything you’d expect to see if a professional had designed your website for you. Though many top shared hosting providers look to prove the value for money of their plans by bundling in free marketing tools and advertising vouchers for services like the Yahoo!/Bing ad network and Google AdWords, FatCow are apparently confident enough to let their low cost and high performance speak for itself. At least, that’s the best reason I could come up with to explain why the company don’t offer up the normal marketing and promotion bundles offered by many of their competitors. I’d say that when it comes to marketing tools, FatCow is generally lacking. Though they do provide access to a free business phone number, this is only for US customers, therefore no help to those of us hosting websites here in the United Kingdom. What is particularly baffling, is that the other two features the company promotes as marketing features are free to use anyway. The promise a ‘Free Yellow Pages Listing’ is all well and good, but a little research reveals that going to the Yellow Pages website means you can list your business for free anyway. The same goes for Hubspot’s Website Grader tool. In fairness, I have found the Website Grader to be a fantastic tool for checking how well my websites are performing and making necessary tweaks, but again, this is free to use for anyone, regardless as to whether or not they have a website, so I’m curious as to why the company promote this as an added-value feature. Not the best then, but as I’ve said many times before on this site, the quality or quantity of free marketing and advertising tools is hardly the most important factor when it comes to determining which host to sign up for, and I’m willing to let FatCow off the hook on this one. One of the main reasons I’m not going to give FatCow a hard time about their poor show in the free marketing and advertising department is that whilst they’re behind their competitors in that area, they’re well ahead in providing comprehensive support for those looking to build an online store. Whilst many unlimited shared hosting plans come with a few basics, such as PayPal integration, one-click Magento installation and support for top shopping cart platforms like CubeCart, osCommerce, and ZenCart (among many others), FatCow take things further than that. Use of the ShopSite eCommerce platform with its own built-in payment gateway for secure processing of credit and debit card payments is a particularly nice touch, as is the use of an SSL certificate. This is one of the key features of any secure online store, and works to encrypt sensitive customer information to keep it safe from security breaches and other website vulnerabilities. 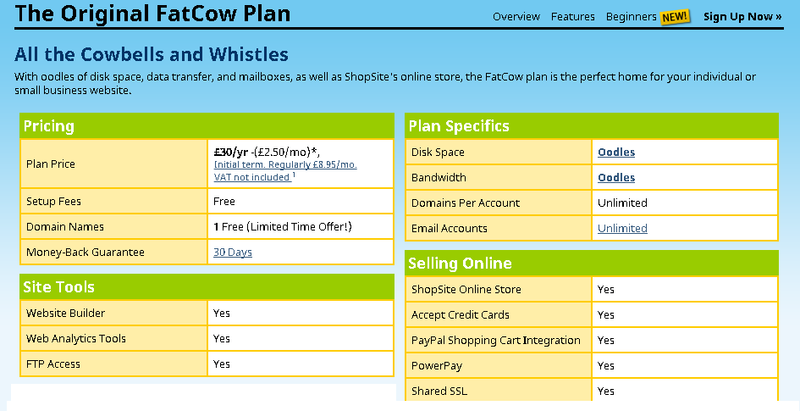 Some companies will charge you anywhere between £48 and £100 for a year’s SSL use, whereas FatCow, much like iPage, include this as part of their unlimited hosting package, and for that reason -if no other- you can’t help but be impressed by the value for money presented to online store owners with FatCow Original. On the whole, I’m pleased to report that FatCow do keep their word. I tried all three customer service channels (phone, email, and live chat), and found that they delivered fast response times, friendly service, and that all but one of my problems was solved there and then on the spot. When it couldn’t be due to the rep needing to look further at the problem, that same rep got back to me exactly when they said they would. The only thing I’m displeased about is their entirely US focussed customer support, which can be a little off putting for UK users, but again isn’t the biggest issue in the world. As I mentioned earlier, there’s an extensive library of step-by-step tutorials, how-to guides and FAQs to help you tackle most common website and web hosting issues yourself, saving you from the time and hassle of contacting customer support. Apart from faster-than-average response times, I can’t say that FatCow’s customer service was in a league of its own, but it does at least compare favourably with many of the brand’s competitors. Combining the best elements of unlimited hosting with a large focus on environmental efficiency, FatCow provide a solid option for businesses who need to reduce their carbon footprint whilst at the same time increasing their online presence. Though they may only be middle of the road in terms of pricing, their excellent performance levels, general user-friendliness and extensive eCommerce support makes them one of the top companies currently on the market, and one I’d be happy to recommend.